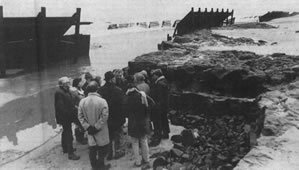 Members of the North Norfolk District Council are pictured inspecting the badly damaged revetment at Happisburgh. Members of North Norfolk District Council coast protection sub-committee held a site meeting on the beach yesterday morning after which they discussed the matter in the council chamber at Cromer. Mr. R.E.A Little said he wondered if they should write to the Department again and say that more damage was being done with every tide. “We need to put pressure on for a decision so that we can order the materials needed, as it will take some time to get them through,” he said. Secretary Mr. Philip Sage told members the DoE had agreed to the new scheme being treated as an amendment to an earlier scheme submitted to them, but the council was now awaiting the Department’s approval to the amended scheme. Members agreed that they should keep pressing for the go-ahead. Mr. Christopher English, the coastal defence consultant, said in a report that both sides of a major breach in the groynes had been held with longer steel piling to prevent the gap from getting wider. The breach near Town Gap had been closed, and the concrete ramp, which was seriously undermined by sea action, had been repaired in concrete. The cliff toe between the ramp and the gabion breastwork was being rapidly eroded and this had now been sheet-piled and a concrete apron added. This was all that could be done as emergency work, and other repairs would have to await the approval of the major repairs scheme, said Mr. English in his report. 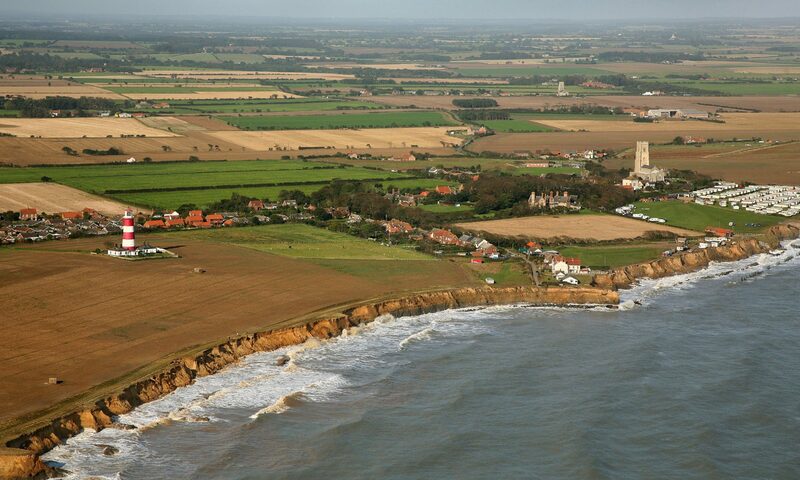 The scheme includes extensive proposals for reconstructing the defences to provide for a stronger revetment over a length of 300 metres, strengthening over a further 150m, and nine new groynes, at an estimated cost of £695,000. After taking into account all grants from the Government, Norfolk County Council, and the block grant, about 15 per cent of the cost will fall on the ratepayers. Mr. English said in his report that up to February 1st, the emergency repair work had cost about £89,000 nett. It was anticipated that by the time all the emergency work was completed, the overall net cost would be £116,000, and the final gross cost, including resident engineer’s supervision and engineer’s fees would be £126,000. Again, some 15 per cent will come from rates, and the rest in grants. During the site meeting members viewed the repair work which had been carried out and discussed the problem of cliff erosion. They were also concerned by the problem of oil on the beach.